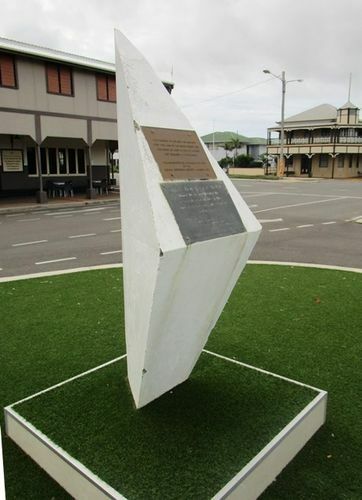 A monument commemorates Bowen's first rail link in the North Coast line which was commenced in 1888. In 1881 the sum of £150,000 was put on the Estimates, and received the approval of Parliament, for a railway from Bowen to Haughton Gap. Had that railway been constructed then, it would have sufficed for a through line from Bowen to Townsville, and given eadh of these towns a fair opportunity to secure the Western trade. Instead of this being done, the commencement of the Bowen line was hindered, and the line from the Reid to Charters Towers was pushed on and opened on December 4, 1882. Strong efforts were made to induce Bowen to accept a railway to the Bowen River coalfield, and in 1885 £100,000 was voted for a railway in that direction. This offer was locally regarded as a red herring drawn accross the track and local residents refused to accept the same, and stuck to their first love. Recognising this, the Townsville's influence then had both sums transferred to be used for the construction of a railway from Bowen to Townsville, via Ayr, and insidiously added the words " and not otherwise". In 1888 the building of the Bowen railway was commenced, and on June 2, 1890, the first section was opened to Guthalungra, and on October 1, 1891, the second to Wangaratta (now Bobawaba) was completed and opened. The Queenslander (Brisbane), 23 June 1906. Just seaward of this plaque. Bowen Historical Society & Museum Inc.